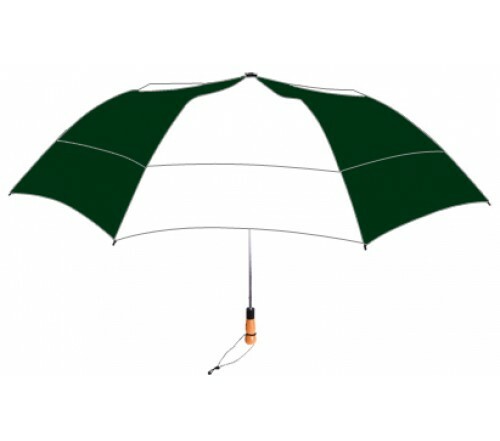 Personalized hunter & white 58” arc vented little giant folding umbrellas are head turners due to this combination and makes a worthy promotional choice for green thinking individuals and marketers. People are always fond of green-white combination because it never loses its charm and looks fresh and evergreen. 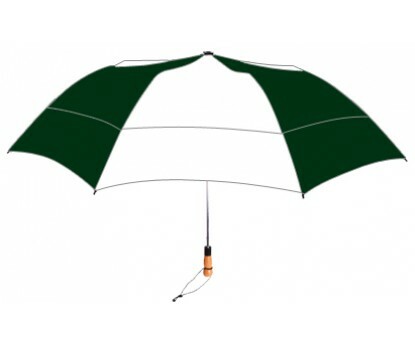 Features –automatic open function, folds to just 22”, larger folding vented 58” arc hunter & white canopy, sturdiest hexagonal chrome shaft, wooden handle with wrist wrap, fiberglass ribs, and is offered with matching fabric case with shoulder strap. Imprint area - 6”H x 8”W.